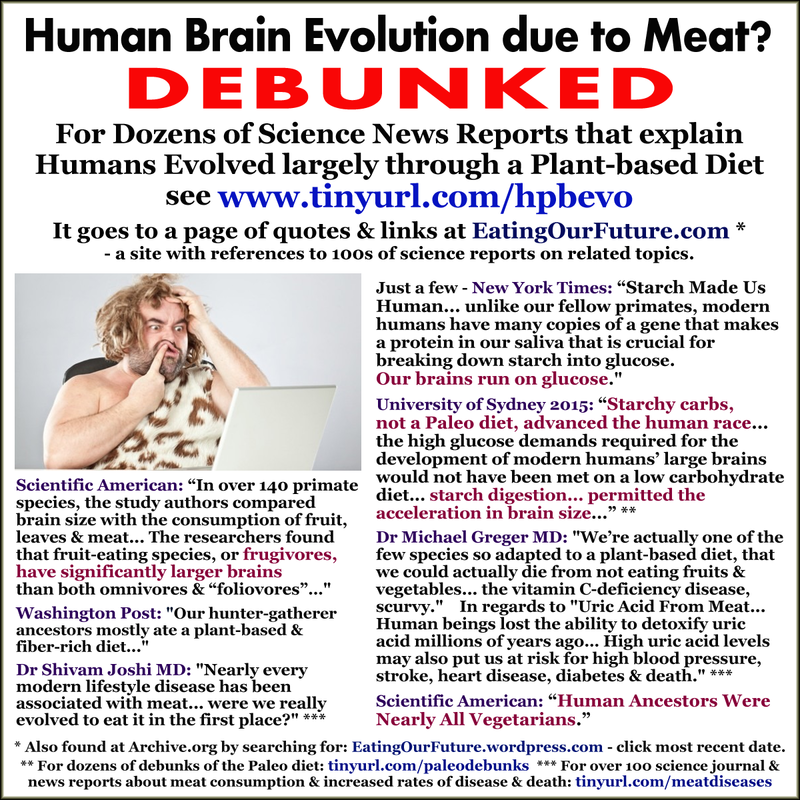 Page Summary: Collection of 20+ clips, quotes & links to science news reports on the Major Role of Plant Foods in Human Evolution with a focus on Increasing Brain Size & Intelligence. Excerpts: “New research suggests Palaeolithic humans would not have evolved on today’s ‘Paleo’ diet. While modern humans have on average six copies of salivary amylase genes, other primates have only an average of two. The exact point at which salivary amylase genes multiplied is uncertain, but genetic evidence suggests it occurred in the last million years, around the same time that cooking became a common practice. A 2007 Nature report is titled “The gene that makes your mouth water.” Excerpts: “Ability to digest starch could have spurred human evolution. Spit might have helped human evolution by enabling our ancestors to harvest more energy from starch than their primate cousins. “High starch foods and a high starch diet have been an important evolutionary force for humans,” says George Perry, an anthropologist at Arizona State University in Tempe, who led the new analysis. Excerpts: “During our truly formative years, the first 90% of our existence, one might say, our nutritional requirements reflect an ancestral past in which we ate mostly leaves, flowers, and fruits—with some bugs thrown in, thanks to wormy apples, to get our vitamin B12. For this reason, another approach that might improve our understanding of the best dietary practices for modern humans is to focus attention not on the past, but rather on the here and now—that is, on study of the foods eaten by our closest living relatives, given the bulk of our ancestral diets, and the lack of evidence supporting any notable diet-related changes in human nutrient requirements, metabolism, or physiology, compared to our fellow great apes. Excerpts: “the researchers say, starchy carbohydrates “were essential for the evolution” of the human brain nearly 1 million years ago. The human brain uses as much as 25 per cent of the body’s energy and up to 60 per cent of blood glucose, the researchers say. The research will help put an end to the fashion of carb-phobia, dietitian Dr Joanna McMillan hoped. McMillan adds that humans have adapted to a variety of diets. Humans are not meat-brained after all, it seems. And for those concerned that carbs were not only unnatural from an evolutionary perspective, but have lead to the obesity epidemic, McMillan says: “Carbs will only be converted to fat if you eat them in excess over your body and brain’s needs – when glycogen stores are full and there is nowhere else for that carbohydrate to go. A 2006 article in Scientific American is titled “Diet and Primate Evolution“. Natural selection strongly favors traits that enhance the efficiency of foraging. Hence, as plant foods assumed increasing importance over evolutionary time (thousands, indeed millions, of years), selection gradually gave rise to the suite of traits now regarded as characteristic of primates. Most of these traits facilitate movement and foraging in trees. For instance, selection yielded hands well suited for grasping slender branches and manipulating found delicacies. Excerpts: “Scientists have long debunked the Paleo diet’s foundational myth that our forefathers and foremothers ate in this one way. From a 2006 article titled “‘Man the Hunter’ theory is debunked in new book” an excerpt: “In his latest book, an anthropologist at Washington University in St. Louis goes against the prevailing view and argues that primates, including early humans, evolved not as hunters but as prey of many predators, including wild dogs and cats, hyenas, eagles and crocodiles. few are aware of how directly these microbes and their genes affect the functioning of our bodies. The human genome found in the nuclei of our cells contains roughly 20,000 genes, but the microbiome — the sum total of genetic material in the microorganisms that live in and on us — contains as many as 20 million genes, all of which are directly or indirectly interacting with and at times even controlling our genes. Our microbial genes are critical to the regulation of our metabolism, to the ability of our immune system to fight off infection and to the production of the neurotransmitters that power our brain and nervous system. The microbiome, just like our nuclear genome, is heritable. The majority of microbes are transferred from mother to child during childbirth, in a chain of transmission that reaches back to the earliest animals that evolved — which happen to have been microbes…. Excerpts: “Starch is one of the body’s largest suppliers of glucose, which is used by every cell as energy. We begin breaking it down from the moment we start chewing, thanks to our amylase enzymes. However, they can only do their jobs effectively when a starch is somewhat cooked. For example, a cooked potato is 20 times more digestible compared to its raw form, evolutionary geneticist Dr. Mark Thomas told The New York Times. According to Hardy’s research team, the human brain uses 25 percent of the body’s energy and 60 percent of the glucose available in the blood to function and grow. Connecting the fact that we need such high quantities, which are typically derived from carbohydrates, and the incredible expansion of brain size during our evolution, the researchers believe it’s highly unlikely that we could have subsisted on a diet that lacked such resources during this critical time. There is also biological evidence that the human body began developing additional amylase gene copies (one person can have up to 18 now) to access this form of nutrition more effectively. Primates only have two copies, so that means we completed this digestive evolution within the past 1 million years when we also had access to fire for cooking. Today, studies of Tanzania’s Hadza people, one of the few remaining hunter-gatherer groups on the planet, are a useful model for understanding just how much fiber early humans probably ate. Tribe members consume 100 to 150 fiber grams per day — enough to fill some 50 bowls of Cheerios, and 10 times what Americans take in, as NPR reported. Their daily diet is rich in roughage — tubers, berries, baobab fruits — and the Hadza people don’t eat any ultra-processed foods.